It is with great sadness that we announce the passing of Eileen Mary Babineau, 85, of Sackville, at the Drew Nursing Home on Monday, January 14, 2019. Born in Salem, NB, Eileen was a daughter of the late Verne and Hazel (Fields) Steeves. Eileen was an avid gardener who loved camping and traveling. 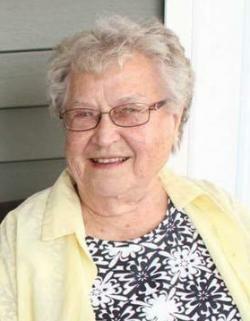 She enjoyed cooking and had cooked for Borden's Restaurant in Sackville for over twenty-five years. She will be sadly missed by two sisters, Audrey Bourque, Moncton, Barbara (Oakley) Beal, Salem, and a brother, Douglas (Beatrice) Steeves, Salem, as well as several nieces and nephews. Besides her parents, Eileen was predeceased by her husband of 46 years, Armand Babineau, and a brother-in-law, Norman Bourque. Arrangements are under the care and guidance of Jones Funeral Home, 70 Bridge Street, Sackville (506-364-1300). Honouring Eileen's wishes, cremation has taken place. A visitation for family and friends will be held from the funeral home on Thursday, January 17, 2019 from 2-4 pm. A Funeral Liturgy of the word will be celebrated at the funeral home on Friday, January 18, 2019, at 11 am. Interment will be held in the Sackville Cemetery in the Spring. Donations in memory of Eileen may be made to the New Brunswick Deaf & Hard of Hearing Services Inc. Sharing of memories and condolences may be sent to the family by visiting Eileen's online memorial at www.jonesfuneralhome.ca or through the Jones Funeral Home Facebook Page. New Brunswick Deaf & Hard of Hearing Services Inc.